o.m.g. 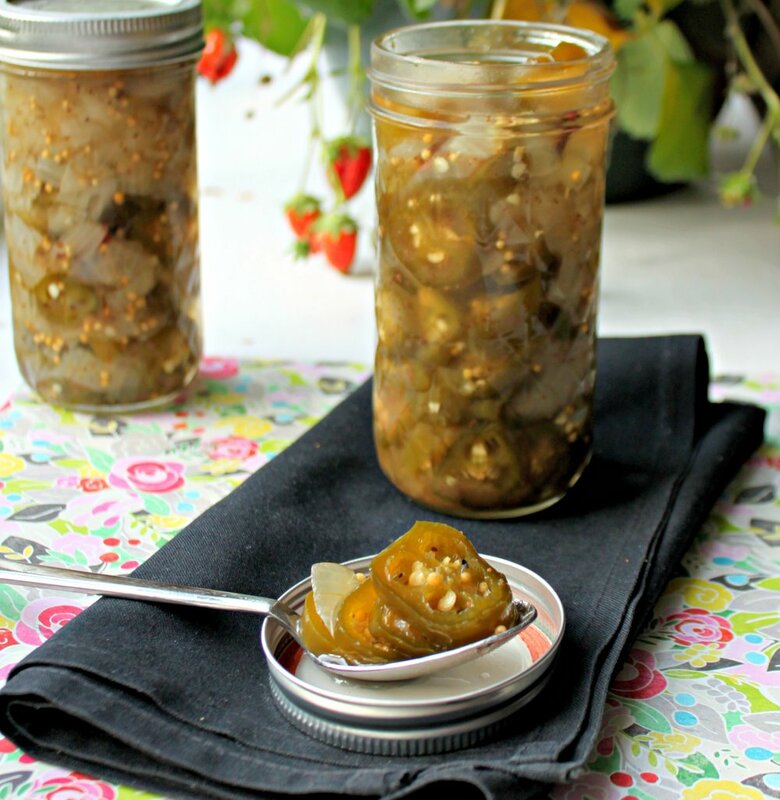 Don't make these pickled jalapenos like I did. I was smack dab in the middle of a terrible, horrible, no-good, very bad stomach flu (like the Alexander reference there? ), and the process of cutting the peppers and measuring the variety of spices was an internal war of wills that I hope to never have again. But I had a ton of jalapenos and they were about to pass their window of freshness, so I needed to use them. And, really, what other good use is there for jalapenos when you are sick with a stomach bug? You just want them out of your house, or in this case, pickled in a jar that you don't have to look at for at least a few days. So, I soldiered on with the recipe. Including the spices. And the heat. And the burning eyes. Ahh. I was glad when it was over. But now, a week or two later, and I'm so glad that I didn't back down and throw them away! They are spicy but with a hint of sweetness that I love. They would be perfect on a hot dog (veggie dog! ), nachos, in a quesadilla or burrito, or really anywhere else you would find jalapenos. I left the seeds in and made slices, but if you want a milder version, take out the seeds when you originally cut the peppers up. And speaking of sweet little peppers, Lily couldn't resist running over when she saw me pull the camera out. And when she saw the ripe strawberries in the background. She ate every single one right off the plant! Cut the stem end off of the jalapeños and cut into thin slices. Add the onions and stir in the salt until everything is well-coated. Cover with a clean, thin towel. Put ice over the towel and place the bowl in the refrigerator to chill for at least 4 hours. After 4 hours, rinse the salt off of the peppers and onions. Drain, and rinse and drain again. In a large sauce pan, put the vinegar, sugar, and spices. Bring to a boil and stir to dissolve the sugar. Add the peppers and onions. Bring to a boil again. As soon as the jalapenos are all cooked through (the color dulls a bit), start packing your canning jars with the peppers and onions, using a slotted spoon. Pack the jars evenly, up to about an inch from the top. Then pour the sugary vinegar mixture over the peppers, until it covers them. Cover the jars and let cool to room temperature before sealing tight and keeping in the refrigerator. As you use the peppers, make sure that the vinegar always covers the peppers.